Is your company having a hard time filling CNC machine operator positions? How ‘smart’ is the CNC control software on your current machines? Are your machines over 10 years old? Are they complicated to operate because they are using older technology that requires specialized knowledge? How does the 20- or 30-year old prospective candidate view the CNC control software technology they would be operating? Will they be impressed or will they think, that it’s old-school? CNC control software capabilities are often influential factors when a prospective candidate decides whether or not to accept or decline a position as a CNC machine operator. Attracting qualified young people to the metal fabrication industry is hard enough, so why not entice them with the latest modern CNC software operating technology? Operating machine controls that reflect current interfaces such as touch screens and other features found on today’s modern smart phones/tablets is an enticing start. 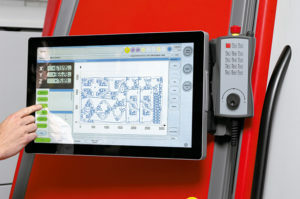 Modern CNC control software makes learning to operate today’s complex machinery faster and easier, enabling operators to be productive almost immediately. Most of today’s high-end technology continues to forge new paths that accomplish tasks faster and better than ever before. Today’s high-end fabrication machinery has built-in “smart knowledge” that’s been incorporated directly into the machine’s software by the equipment manufacturer. The bottom line is that you no longer need to hire only experienced operators. For the most part, the “old-school” knowledge has been incorporated into the modern CNC control software that drive the machines. While we all recognize the value of new, innovative equipment, we sometimes overlook the competitive advantages that innovative software creates. Machine and software innovations drive greater productivity and efficiency. They provide the competitive advantage companies are looking for. They make it easier for companies to attract and hire new machine operators. The next time you are looking for a metal cutting or bending machine remember to spend some time looking closely at the software. Don’t just look at the offline programming software. Look at the embedded software systems and controls that drive the machine and make it easy to operate. Software and controls can truly make all the difference in getting from the order to the finished product in a timely and efficient manner. They can also make the hiring process much easier.